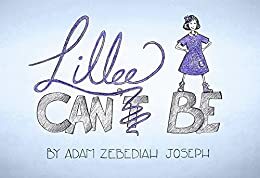 Adam Zebediah Joseph’s Lillee Can Be delivers a sugary sweet children’s book with a punchy, poetic pace and solid sense of cohesion overall. The book focuses on the school and extracurricular lives of two young twins in an unspecified setting, making it an allegory of sorts. Specifically, the twins provide a totally relatable dynamic for any reader with a sibling, as the book directly confronts feelings of inferiority, unequal recognition, and other relevant issues that many children experience. Likewise, the author is perfectly on trend with the wave of subtle social justice and advocacy messages within children’s and young adult literature currently. For example, Joseph boldly tackles sexism, gender identity, equal pay, and other concepts beyond merely familial themes, yet he does it with humility, honesty, and ease, without any preachy or condescending tones. Although the male character is unnamed, the female character (or mini SHE-RO!) offers an affirmative, fun, feisty, and feminist protagonist for readers to emulate. Lillee, the main character, demonstrates resilience and displays fearless fortitude as she faces gender boundaries and revolutions about our world, social norms, and cultural mores in this vibrant but also bold, bubbly book. As far as the pros and cons, I love that the book perceptively resonates with girl power. I also applaud how his writing cleverly employs a rhythmical quality that makes you want to sing or rap each page aloud-of course with a fist pump, too! I further appreciate the teachable lessons in this book beyond character education and tolerance, since Adam Zebediah Joseph also cites many careers for young children to pursue. Occupational terms in this book and illustrations make it suitable for a teacher, counselor, parent, or family member and embed superb context clues for the definitions. However, I was a bit dismayed that the male twin character remained nameless throughout the entire piece. This anonymity seemed to counter the equity themes that this book so adamantly advocated. While I also liked the pictures, I wanted a bit more multicultural depictions to truly illuminate the themes that book defends: equality, respect, inclusion, etc. In sum, this book provides a mirror for young readers to assess not only themselves and their personal relationships around them, but also a path for sociopolitical awareness. Read it yourself to see if a fairy godmother emerges or if other lessons enlighten these characters as they grow and mature. The author shows empathy and wisdom to tackle themes with such poise and poetic power!